Ryan and Monique jogged very well together as they were both in excellent physical condition. After about five minutes had elapsed, Monique glanced to her right to take a look at Lake Okanagan. About fifty meters away she saw a large object moving in the water. It appeared to be black in color and had a cylindrical shape. To Monique, it looked like a living creature. She knew it was not a boat. “Look it’s moving in undulations and looks like some kind of whale,” Monique observed. “As far as I know there aren’t any whales in Lake Okanagan. At least any that look like that,” Ryan said. Ryan had a pair of powerful binoculars in his back pack. He took them out and got a close up view of the creature in the water. Ryan felt chills when he saw the animal’s head surface. “I know what it is now,” he said in a shaky voice. “What is it?” Monique asked. “You mean it’s the real live version of the toy things they sell to tourists in the local stores?” Monique asked. “Yes, I do. I have a digital Samsung in my back pack. Monique quickly took out her camera and snapped two pictures of the animal. Just after she took the pictures she saw a fishing boat about one hundred meters away. The creature then submerged back into the lake. Ryan and Monique both studied the preview pictures on her camera. The creature appeared to be very small and a great distance away. “Well, your pictures will never stand as conclusive scientific evidence of the existence of Ogopogo, but at least we know what we saw and have pictures to back it up,” Ryan said. 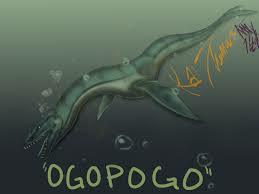 “Did you believe in Ogopogo before you saw it today?’ Monique asked.